Welcome to Stuart Town (Ironbarks)! 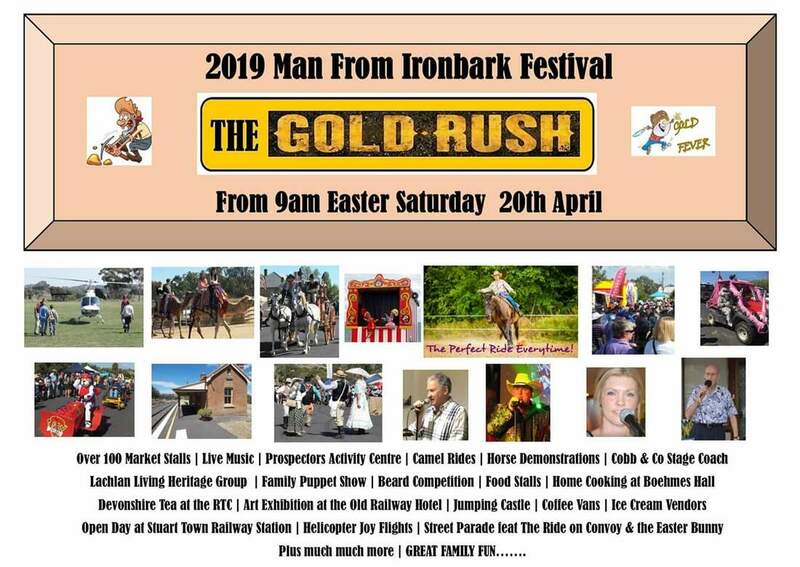 Preparations are now well underway for the 2019 Man From Ironbark Festival! ​In 2018, we catered for over 5,000 visitors on the day. There were also 120 stalls selling nearly everything imaginable - from food and drinks to clothing. The 2019 festival could be even bigger and better! ​Don't forget to put it in the calendar for 2019! Banjo Patteron's famous poem "the Man from Ironbark" is based on the small locality of Stuart Town between Orange and Wellington. This weekend, as part of its annual celebrations, the town took time out, and paid tribute to its cultural heritage. On the 26th of March, 2016 Stuart Town celebrated The Man From Ironbark Festival. ​It was a warm day but that didn't deter an estimated 4,000 people from attending throughout the day. There were horse and carriage rides, food and coffee stands, face painting, numerous different rides for the kids, helicopter joy flights and a large number of stalls selling just about everything you could think of. ​The overwhelming feedback from visitors and stall owners was that it was a wonderful day and a great success. The team from WIN News Central West also attended the festival and you can watch the video above to see what was televised during the local news programme. The Official Stuart Town RTC Cook Book is now on sale! Drop in or contact the Stuart Town RTC (0268 468 359 or StuartTownRTC@hotmail.com) to get your copy now. ​These ANZAC Day DVDs are an excellent record of Stuart Town ANZAC Day service and they are a wonderful memento for people of all ages. ​Pop in and grab a DVD when you are next passing by, or feel free to call the RTC on 0268 468 359 and order a copy to be posted out to you. Margaret and the team are only too happy to help you in whatever way they can. The Stuart Town RTC turns 10! 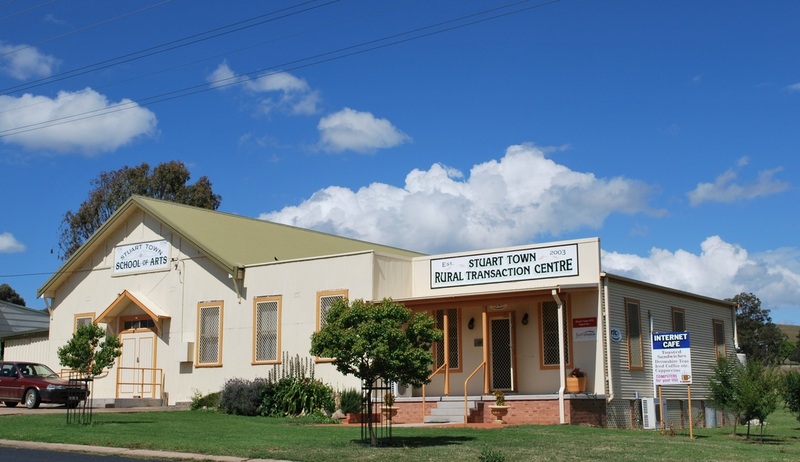 Ten years ago, the Rural Transaction Centre was opened - we celebrated the anniversary with an afternoon tea and took the opportunity to look back over this great community achievement. The Stuart Town is now on Facebook! Stuart Town now has a Facebook page! Be sure to visit and "Like" the page so you can keep up with the latest developments and events. Please also feel free to send us photos and news stories of interest so that we can share them with the other followers. Robert Starkey of Wollongong has completed a new book about the Trudgett Family History. This book covers the history of Robert and Constance Trudgett and their family. The book is 638 pages and is packed with history, stories and historic photos. If you would like to order the book or find out more about it, please contact Robert on (02) 4284 7629 for more information. Please note that these videos have been sped up! We did not drive really fast to keep the video clips nice and short. I hope you enjoy these videos and please let us know if you have any requests for future video clips. We are proud to introduce the publication “Branches from Ironbarks”……a journey through time. It is the sequel to “Whispers from Ironbarks”. The book is principally about families of the area and is a longstanding record of life in and around Ironbarks. There are 192 different family names included, although some branches bearing the same surname have different origins. Names are arranged alphabetically. It is by no means a complete history of all the families from Ironbarks and its environs. It is an integral part of the ‘never ending story’ of Mookerawa, Gum Flat, Walters, Butcher’s Flat, Codner’s Flat, Lower Mookerawa, Omigal, Stuart Town, Farnham, Stony Creek and Store Creek. It is a must for the ‘history buff’ and anyone associated with the above locations. We have published information and photos (some of which are historical ‘gems’), collected over the years by former and present residents, as well as people from all points of the globe, with ties to the area. Each story is unique, telling family details, place of abode, school attended and social conditions at that period of time. So many people have connections with the region whether it is through early settlers, gold seekers, railway employees, the depression period and more recently the construction of Lake Burrendong. We have an archive facility locally and we welcome additional records, as hopefully, in the foreseeable future, some aspiring journalist will produce another historical document from this very early settled area! So many people visit the area hoping to gather information on their ancestors. 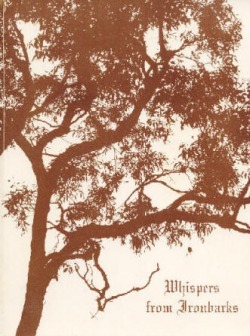 Reprint of "Whispers from Ironbarks"
For those who are unaware of this publication: it is the history of Ironbarks, Stuart Town, Stoney Creek, Farnham, Store Creek, Omigal, Mookerawa, Lower Mookerawa, Cookeys Flat, Codners Flat, Gum Flat, Walters and Butchers Flat. It contains information on each of these communities, including schools, post offices and social activities as well as numerous photographs. The first release in 1988 sold in a matter of months and since then, over the fifteen years we continue to have repeated requests for this book. The cost is $35.00 plus postage and handling.